Time really can fly throughout the year and you may find that important dates can creep up on you without warning. In order to help you keep ahead of the deadlines and avoid any last-minute panics, we have put together a personal tax dates guide so that you can plan for in the coming year. 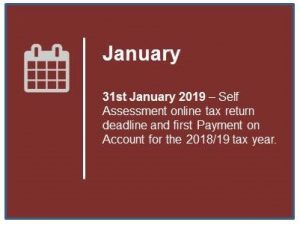 31st January 2019 – Self Assessment online tax return deadline and first Payment on Account for the 2018/19 tax year. 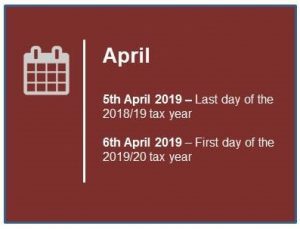 5th April 2019 – Last day of the 2018/19 tax year. 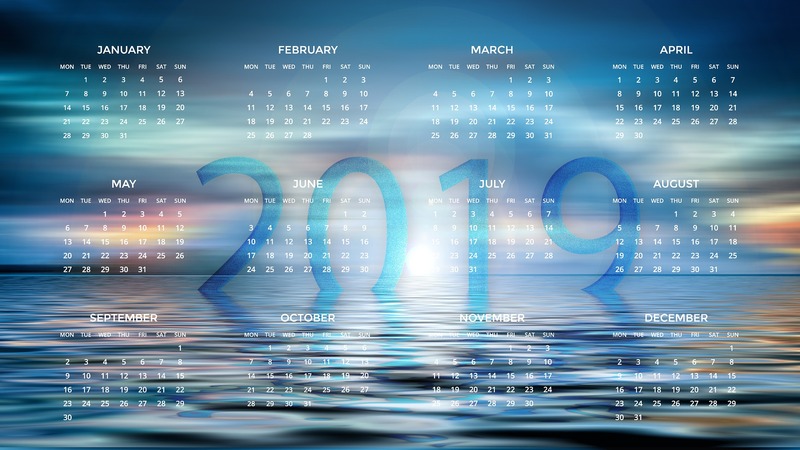 6th April 2019 – First day of the 2019/20 tax year. 31st July 2019 – 2nd Payment on Account for the 2018/19 tax year. 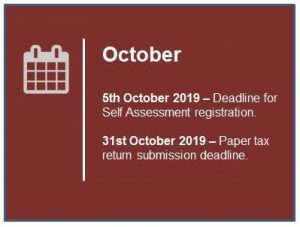 5th October 2019 – Deadline for Self Assessment registration for self-employed, freelancers or additional income earners. 31st October 2019 – Paper tax return submission deadline. 30th December 2019 – Submit online tax return if you want HMRC to automatically collect tax you owe from your wages or pension. This is one of the most important dates of the whole year for self-employed people and business owners. Self Assessment submissions are due by midnight on 31st January 2019. If you miss this deadline you could end up paying a considerable penalty. Make sure you provide your accountant with all the necessary tax documentation so that they can submit your Return on time. You will also need to pay your first Payment on Account for the 2018/19 tax year on this date. There are two payments required and the deadline for the second payment is 31st July. Each of these Payments on Account are 50% of your previous year’s tax bill. By this date you should have all of your documents, statements, receipts and accounts in order. This will ensure that going forward, tax returns are easier to complete and ultimately, should you ever be subjected to an audit, the taxman will have a full view of your annual accounts. The first day of the new tax year is when many Government changes to tax regulations can come into effect. Your accountant will be aware of these changes too and should advise you of any need to change your processes in order to abide by the new regulations. You could use the new tax year as an opportunity to reassess your methods for recording income and expenditure and implement processes that are significantly easier. Your second Payment on Account needs to be paid on this date. If your Tax Return is processed and filed with HMRC before 31st July 2019, your Payment on Account will be adjusted to the actual amount due if this is a lower amount. You must notify HMRC and register for Self Assessment if you have recently become self-employed or have received additional income in the last tax year. Missing this deadline may incur penalties. If you have income from PAYE and a tax bill of less than £3,000 and want this to be collected by wage deductions over 12 months from April 2020, you must submit your paper return by 31st October 2019. This is subject to you having enough earnings to deduct the tax due. You already pay tax through PAYE, for example you are an employee or you get a company pension. 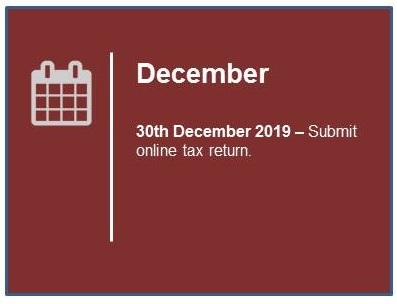 You submitted your paper tax return by 31st October or your online tax return by 30th December.